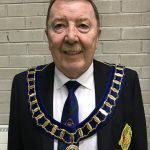 As we approach the beginning of another bowling season, I am very honoured and privileged to be President of the NIBA in 2019 and I wish to thank the GP Committee for the nomination and to the officers and members of Donaghadee Bowling Club for their support. I was delighted to have assisted outgoing President Jim McConville during his successful year in office. As the Association unfurling draws close, I am very aware that the year may well be a very busy one, nonetheless, I look forward to representing you and our Association in every aspect required as your President. My best wishes to North Down Bowling Club who celebrate their centenary, having joined the NIBA on 17 March 1919 and to Gilnahirk Bowling Club as they approach their 50th later in the year. Finally, I wish all our members an enjoyable years bowling, more importantly the health to enjoy, and I look forward to meeting you all sometime during the season.